Wheat flour grain mill manufacturer design primarily for individual usage. 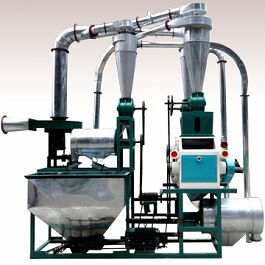 Although these are small wheat flour grain mill, they can process a number of materials such as maize, corn, rice and sorghum. It consists of a two-part system, a wheat cleaning system and flour grinding system. Wheat cleaning system utilizes a pneumatic cleaning methodology. The flour grinding system is composed of good quality, high speed roller mill, a reinforced flour extractor, a blower, and air-tight pipes.